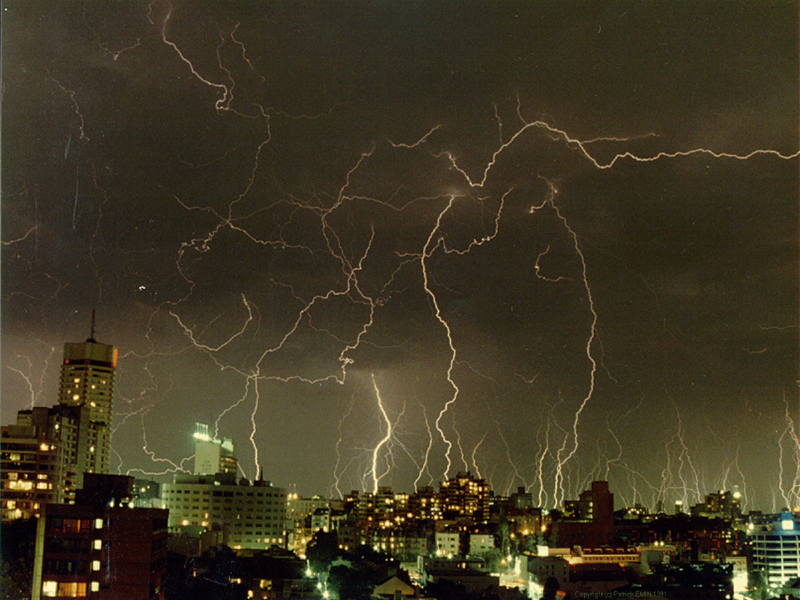 Thunderstorms of a Noachian proportion blast the city for three days, washing the sun from the sky. White water eddies cluttered with trash swirl around the tires of cars abandoned until the deluge subsides. Undulating sheets of rain reduce all human activity to that of water-logged muskrats scurrying from building to bus stop and back again. When the skies finally clear, the ancient apartment building smells like books stored in the basement. Tenants prop open their doors with fans to shift the staleness from corner to corner, never allowing it to settle on the pages of their lives. Cycling dehumidifiers placed by the landlord lure the saturated air with the promise of stagnation in the too-small reservoirs. Joel’s fingertips rest on the windowsill; his eyes scan the street three stories below. Part of him wants to go downstairs to search for the movers’ truck. They were scheduled to arrive at nine that morning but probably couldn’t find a place to park out front. For all he knows, they’re circling the block or double parked, ticketed, and arguing with a cop. His fingers drum impatiently, and he sighs. His own lack of punctuality over the years has not made him lenient toward other people’s lateness. Another stack of books is removed from the shelves, the void outlined in dust, and absentmindedly placed in a cardboard box. All week things he’d rather be doing kept popping into his head, but he doesn’t have the leisure of avoiding the chore, and no one else is going to do it for him. The zip of duct tape brings Kirsten from the bedroom. Her eyes are red and swollen. Joel kneels to press the duct tape along the seam of the cardboard flaps. When he looks up, a forced smile twists his mouth sideways. A quick peck to her forehead conceals his cringe at having misspoken, but now he’s afraid his kiss also sends the wrong message. She shuffles to the doll-sized kitchen, the slap and scuff of her slippers grating on Joel’s already frayed nerves. Gray sweatpants and hoodie render her dancer’s body shapeless. Her unwashed hair is pulled into a sloppy ponytail, exposing her long neck as she stands at the sink filling the kettle with water. Damn he loves the sight of her neck. It was the first place he ever kissed her, right where the long, sable strands stopped and the micro fine, colorless ones began. She had been wearing a ponytail then, too. He could spend hours making love to her neck alone, her warm flesh goose-pimpling beneath his parted lips, and the sweet scent of lily of the valley residing behind her ear. Being with Kirsten felt like standing in intense, bright sunshine, and looking at her like viewing diamonds of light dancing on water until his eyes teared, the pain so sweet. He believed he possessed something truly worth having when he held her in his arms; he was free and bound all at once in his love for her. Joel’s eyes close like a stage curtain dropping on the memory. He remains motionless for several seconds listening to the click and ragged woof of the burner. When his body sways, his eyes flick open. Dizziness on the fringe of his senses is replaced with the claustrophobia of the stuffy living room crammed with packed boxes of his stuff. He nods at Kirsten and wanders about the room gathering the last few items that defined his space in their home. A high school swimming trophy, the book on Albert Einstein he is currently reading, a chipped clay dinosaur he made in first grade, the teak kaleidoscope Kirsten gave him for Hanukkah, a Lego pirate, his Call of Duty video game; all these items are cradled in his arms. Again he looks out the window wondering where the hell the movers are. Kirsten searches the cupboard where it should be and all the ones in which it was never stored, opening and slamming the doors shut, making little noises in her throat every time she doesn’t find it. Gathering clouds and the return of soft rain diminishes the light in the narrow room, fuzzing the crisp edges of the long shadows. Joel listens to the patter against the windows, his thoughts disturbed by the remembrance that she doesn’t have a favorite mug. Another lie. Kirsten removes the kettle from the burner when the metal begins to tick and hiss with the strain of the boil inside. The simple process of drinking tea will draw them together one more time when all Joel really wants is for Kirsten to leave so he can focus on packing. Anything would be better than the haphazard orbit they’ve danced for the past three weeks, tactfully avoiding each other but never able to escape the other’s pull. A few dunks of the tea bag and Kirsten plops down on the loveseat with both legs tucked beneath her. She splashes the hot tea on her hand and winces with childlike poutiness. The mug intended for Joel stands alone on the countertop. He can feel a bee swarm of bitterness rising in his chest as he dumps the gathered items in his arms on the countertop next to the tea. He knows Kirsten wants him to join her on the loveseat, but he resists her wishes. Much to his surprise, he has to resist his own as well. To drink the tea means he’s yielding his will to hers, but he doesn’t know what to do with her simple offering. It’s just tea, though; green tea with jasmine, his favorite tea in her pretended favorite mug. The unspoken request for forgiveness swirls upward with the coils of fragrant steam. The thing is, Joel wants to forgive Kirsten. The knotted rope of muscles between his shoulders would finally be eased; his stomach would stop roiling like a bad chemistry experiment. And how many times has he heard in life that forgiveness is as much for him as it is for the other person? Countless. Just do it, he thinks and chuckles at relationship advice coming from a Nike ad. Kirsten reaches between the loveseat cushions to retrieve the remote. She points it at the stereo releasing Monica’s voice into the room. Angel of Mine fills up every ounce of space not already taken up by moving boxes and furniture. Joel’s shoulders sag, and his weight shifts to one hip. When she pats the space beside her, he obeys. Joel seriously considers a scalding gulp of tea to keep from saying what he truly wants to say and to keep the conversation from deteriorating into an argument. Monica has given way to Marvin crooning about sexual healing. He stands too quickly, spilling tea on his cargo pants. As he pauses to brush at the blossoming stain, she jumps up to follow and runs into his bent back, dousing his ratty cardigan with tea. Her hands join his in trying to wipe away the liquid, but he pushes her away bodily with his arm. The stupidly obvious statement silences him; he stares at her as if she suddenly grew scales on her lovely neck. With exaggerated precision of movement, he walks to the boxes stacked three high. The top two are removed with great flourish, and then Joel pauses to make sure Kirsten watches. He grabs the doubled-over, duct tape handle he fashioned and rips it from the box removing a great deal of cardboard with it. The ragged scar across the edges will be difficult to reseal. All manner of clothing is flung about the room until he locates a pair of jeans and a t-shirt. The neat freak in Joel stalks past the mess without stopping to pick it up. He heads for the bedroom with Kirsten in tow. Janet calls from the stereo reminding him that’s the way love is. He tosses his clean clothes on the dresser then sheds the drenched cardigan and throws it at her feet, turning his back on her to remove the rest of his clothes. When he faces her, she has his sweater, pants, and shirt clutched in her arms, pressed to her face. Her muffled voice comes to him edged in tears. Cool air makes his skin prickle; he feels like a fool in just his socks and underwear. A shiver makes him cross his arms. She lifts her face from the soggy bundle. Every fiber of his being wants to beg her for forgiveness, no longer caring that the blame has shifted to him. He accepts it willingly, never questioning how he came to be the one needing to explain his actions. Kirsten tucks Joel’s shirt and pants under her arm. With the clothes pressed against her body it’s difficult to properly fold the sweater, but she does. The precious garment is placed on the dresser, the ordinary clothes dropped. She stand before him for so long that he doesn’t know what to do next. Instinctively, his arms pull Kirsten against his chest where his skin quivers at her presence. His mouth seeks her forehead, her cheek, her earlobe. Joel slips outside of his own body, watching his hands sneak under the draw-string waistband of her sweatshirt, caressing her back as they move upward. He sees with his fingers that she isn’t wearing a bra. Luther tells him all that matters is here and now. So Joel submits to the sacredness of the moment, the opportunity to occupy the same space as Kirsten, the chance to reknit the warp and weft of the fabric of their life together. Time stops, and the morning is lost to work more satisfying than packing boxes. There is no before, no after, only rain drumming a cadence on the roof of their building, the sound dulling Joel’s consciousness as he sinks into the softness of Kirsten’s embrace. He spirals downward toward sleep, aware of the sensation overtaking him until his body jerks. The buzzing cell phone vibrates on the hardwood floor, demanding attention. A missed call is followed by three rapid-fire texts. Joel slips from the tangle of Kirsten’s arms and legs, twisting on the bed to pick up her cell phone where it fell when she undressed. Plastic and tidbits of circuitry fly in every direction when the cell phone hits the closet door. Kirsten sits up in bed and points at the debris of her new iPhone freed from its hot pink paisley cover. Joel grabs his tea-stained, damp pants from the floor and jams his foot into one leg, hopping around on the other foot. He spins around and loses his balance, his feet tangled in both empty pant legs as his knees crash into the bed, and he lands on his outstretched arms. His face is only inches from hers. Kirsten laughs and places her palms on either side of his face. Her arms assume the fifth position as she reclines on the bed, but her legs are in second beneath the covers. Disgust contorts Joel’s face, and he pushes himself upright. With his back to her, he finishes dressing. A sneaked look in the mirror on the bedroom door reflects her image with drawn up knees and her chin resting on her crossed arms. Wide-eyed, innocent Kirsten has returned. Joel sits on the caned chair by the window. The torn seat gives under his weight but does not break. His eyes search the view outside, his back still toward her, as Tina asks what’s love got to do with it. Joel squints when sunlight slices through the partially drawn bedroom curtains. He stands to lift his face toward the brightness like a sunflower. His chin drops to his chest as the squeal of brakes on the street below signals the arrival of the moving van. Kind of a sad ending. Wish they would have worked it out. It did cause emotion in me so I guess what you were intending to write was successful. Well written. Oh yes, I’m all about emotion! Glad you enjoyed it. Thank you. Thank you, Rosita, for the incredible compliment. I’m glad you enjoyed the story. Best wishes. A sad but perfect ending. You are a fantastic writer. Thanks, Diana! I’m curious to know how you feel about the kid and the situation.